We are the dealers for all types of Gloves for Industrial purposes. Our range of gloves include Knitted Gloves for daily use. Welding Gloves, Nitrile Gloves, Super Nitrile RNF-15 Gloves, Nitrile Coated Gloves, Dotted Gloves, Latex Gloves, Cut Resistant, Heat Resistant Gloves are the varieties that are readily available with us. Nylon / Polyester Seamless knitted soft liner combined with unique formulation of nitrile dipping provides excellent level of comfirt & dexterity. The nitrile coating provides excellent abrasion resistance with superior grip in wet as well as dry applications. Open back for greater breathability. Stretched filament yarn ensures low lint ensuring high sensitivity of hands. Also available in fully coated in front and back & up to knuckle dipon the back for extra protection. Available in sizes from S to XL and colours include Grey on White, Black on Black, Black on Blue, Black on high visibility colours such as Yellow/Orange/Green/Red/Blue. Handling Delicate & Lubricated Components. 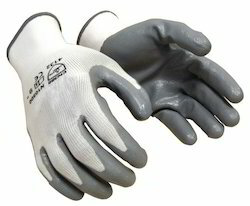 RNF 15 Super Nirtile Gloves are made from Premium grade Acrylonitrile Butadiene rubber. 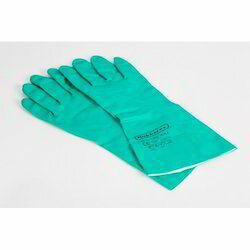 They are specially formulated for improved dexterity and has flocklined interior for increased comfort.RNF 15 Super Nitrile Gloves are resistant to solvents, Oils, fats & are food safe with compliance to CE & FDA. Colours available are Green & Blue. Sizes available from S to XXXL. Automobile components Assembly & Manufacturing.